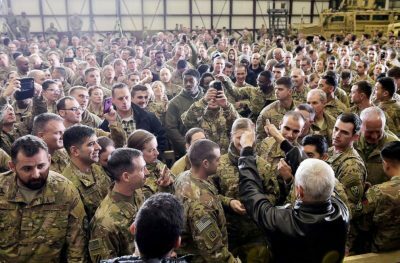 The American Vice President said that Trump had “put Pakistan on notice” with his recently unveiled National Security Strategy, employing the exact same language that had earlier been used against the US’ hated Iranian rival and strongly implying that Islamabad might be the next member in an expanded “Axis of Evil”, though this might tremendously backfire against American interests if its multipolar rivals institutionalize their cooperation through the “Golden Circle” in response. The phrase “to put on notice” is the exact same one that Trump used in reference to Iran in February when condemning its latest missile test at the time, choosing such language because of the implied threat that it carries of an impending military response. In the Pakistani context, “putting the country on notice” might be an advance hint that the US is considering cross-border drone strikes or possibly even special forces raids against its one-time ally in the War on Terror, even though Islamabad promised earlier this month that it would shoot down any unmanned aerial vehicles that violate its sovereign airspace. The Trump Administration is likely preparing the scenario that the author warned about over the summer in which the US bombs and then subsequently sanctions CPEC on “anti-terrorist” pretexts, something which could immediately happen if Pakistan manages to shoot at (and not even shoot down) any American aerial vehicle (whether manner or unmanned) that infringes its borders. Observers shouldn’t be surprised by the US’ anti-Pakistani policies since the writing was on the wall ever since Trump’s election, with the author accurately predicting just days after that epochal event that “Trump will also be especially attracted to Modi’s jingoism that Pakistan is a ‘Muslim terrorist-exporting Chinese ally’ and will thus double down on the joint US-Indian Hybrid War on CPEC (the China-Pakistan Economic Corridor)”. This has all come to pass with the President’s “Afghan” strategy, Mattis’ anti-CPEC statements, and the relevant South Asian section of the US’ new National Security Strategy, proving beyond any reasonable doubt that the US is indeed waging a Hybrid War on CPEC. In connection with this development and the overall trend of 21st-century geopolitics, the US is teaming up with India as its desired “Lead From Behind” partner for “containing China” across the next eight decades, strongly suggesting that the allied American and Indian intelligence agencies of CIA and RAW will continue wielding the weapon of Baloch and Afghan-based terrorism against Pakistan. The author warned in summer 2016 that the Baloch campaign could dangerously spill over the border into the Iranian province of Sistan and Baluchestan, thus “killing two birds with one stone” from the strategic perspective of the US because it could undermine Tehran just as much as Islamabad, though Pakistan will nevertheless be more impacted by this because its own province of Balochistan hosts the terminal CPEC port of Gwadar. As the US ramps up its Hybrid War on Pakistan, it will instinctively rely on the infowar component of the recently unveiled National Security Strategy to craft the narrative that the South Asian state is just as much of an “evil terrorist-exporting destabilizer” as Iran, thus redirecting the world’s attention eastwards from the “Syraq” theater in hinting that the new geographic focus of the US’ “War on Terror” will be the transregional West Asian-South Asian space, or in other words, Iran and Pakistan. Iran is one of the original members of Bush’s infamous “Axis of Evil”, and Pence’s invocation of the same hostile language that Trump used against Iran in threatening that Pakistan has also been “put on notice” indicates that the South Asian Islamic Republic is about to be grouped into the same category of state-level “threats” as its West Asian neighbor, which can be expanded to include Russia and China when accounting for the US’ 2015 National Military Strategy. Pakistan’s impending inclusion in this ignoble grouping augurs very negatively for its Turkish ally, which has been in the prolonged (and painful) process of progressively pivoting away from the West and embracing its newfound multipolar partners of Russia and Iran, so the end result will probably see these four countries and China embodying an “Axis of Evil 2.0” in the eyes of American strategists. The Russian-Chinese Strategic Partnership functions as its own critical mass of power in Eurasia, but the three Muslim states are also slowly coming together with one another to form what the author described earlier this year as a “Multipolar CENTO”, thus crystalizing a significant center of geostrategic gravity in the international Muslim community, or “Ummah”, that enjoys close multidimensional relations with Moscow and Beijing (with the former being propelled by the country’s “progressive” foreign policy faction). This state of affair means that the five multipolar Great Powers aren’t an “Axis of Evil”, but rather an “Axis of Resistance” that are joining forces to reform the global system and complete the ongoing transition away from unipolarity, so the most effective response that each of them can have to Pence’s foreboding message to Pakistan is to enhance their collective cooperation with one another by finding a means to officially institutionalize it. The crisscrossing Great Power networks of the Russian-Chinese Strategic Partnership, the Multipolar CENTO, the Chinese-Pakistani Strategic Partnership, the Astana Tripartite (of Russia, Iran, and Turkey), and the fast-moving Russian–Pakistani Rapprochement need to be formally brought together in a single platform, one which could be given the catchy name of the “Golden Circle” in homage to the description that others have previously used when discussing this future format. Furthermore, all five countries and Afghanistan will be meeting in Islamabad for a three-day speakers’ conference from 23-25 December focusing on parliamentary cooperation for peace, connectivity, and prosperity in the broader region, so the framework for the “Golden Circle” is already being established and just needs to be taken to the next level, which could realistically happen as early as sometime next year once all of these states begin to experience concerted American pressure against them once the US starts applying the Trump Doctrine in practice. All in all, while the US is confident that it can “contain” the multipolar Eurasian Great Powers and pick them off one by one with Hybrid War, it will probably be stunned when it finds out that its aggressive efforts to dismantle the emerging Multipolar World Order are actually strengthening it by catalyzing the formal creation of the “Golden Circle”.